Paul Winchell (December 21, 1922 – June 24, 2005) was an American ventriloquist, comedian, actor, voice actor, humanitarian and inventor whose career flourished in the 1950s and 1960s. From 1950–1954, he hosted The Paul Winchell Show, which also used two other titles during its prime time run on NBC, The Speidel Show, and What's My Name?. Winchell was born Paul Wilchinsky in New York City on December 21, 1922 to Solomon Wilchinsky and Clara Fuchs. His father was a tailor. His grandparents were Jewish immigrants from Russian Poland and Austria-Hungary. Winchell's initial ambition was to become a doctor, but the Depression wiped out any chance of his family's ability to afford medical school tuition. At age 13, he contracted polio. While recovering, he happened upon a magazine advertisement offering a ventriloquism kit for ten cents. Back at school, he asked his art teacher, Jerod Magon, if he could receive class credit for creating a ventriloquist's dummy. Mr. Magon was agreeable, and Winchell named his creation Jerry Mahoney, by way of thanks. Winchell went back to reading magazines, gathering jokes from them and putting together a comedy routine, which he then took to the Major Bowes Amateur Hour in 1938, winning first prize. A touring offer, playing various theaters with the Major Bowes Review, was part of the prize. Bandleader Ted Weems saw the young Winchell while on tour; he visited Winchell and made him an offer of employment. Winchell accepted and became a professional at age 14. 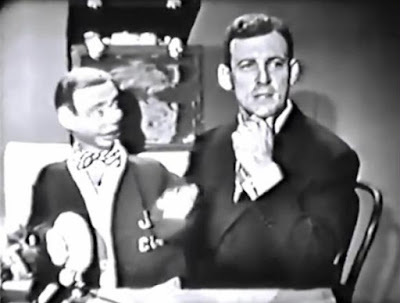 Let's go back 60 years to 1956 and visit with Paul Winchell and his two dummies, Jerry Mahoney and Knucklehead. Paul Winchell held over 30 patents... many in the field of medicine. He invented and patented one of the first Artificial Hearts (prior to Jarvik) along with Dr. Heimlich. He donated the heart to the University of Utah so that they could continue doing work on it. He also developed a system for farm raising Tilapia fish in sub-Saharan Africa. He worked with the Leukemia Foundation and the American Red Cross. One of his inventions was a blood plasma defroster. He was a brilliant man on so many levels.